A file photo of APC National Chairman, Adams Oshiomhole. The National Chairman of the All Progressives Congress (APC) says the presidential candidate of the Peoples Democratic Party (PDP) in the just concluded election was never destined to be Nigeria’s President. He stated this on Thursday during a press conference in Abuja, the nation’s capital. Oshiomhole was reacting to an earlier comment made by Atiku where he stated that the nation’s future rests with his presidency. “But I think it also borders on arrogance. For Atiku Abubakar to suggest that our future is tied to his presidency. Atiku is destined never to be President of Nigeria,” Oshiomhole said. He also accused Atiku of decamping from one political party to another all in a desperate bid to become the nation’s President. According to Oshiomhole, Atiku’s alleged desperation created a conflict with former President Olusegun Obasanjo when he was Vice President. “Atiku’s desperation is so obvious. He is so desperate that in 2003, he challenged his own boss, President Olusegun Obasanjo not to do a second term. “He decamped to join (the defunct) Action Congress of Nigeria (ACN). I was in ACN then, we offered him the ticket and he lost the election and returned to PDP. “He contested again and lost the nomination and because he has only his interest at heart, he decamped again from PDP and returned to APC. “He joined us in Lagos and rolled out the dollars, but we voted for Buhari as our candidate. He knew that he cannot defeat Buhari in the primary and went back to the PDP. “Does he think that Nigerians are so insane as to think that a man who is not stable and whose interest is about himself will be a possible candidate to be elected at a time like this?” he questioned. 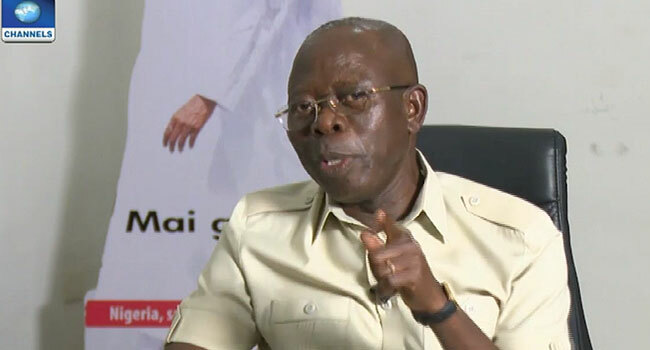 Oshiomhole’s comments come a day after Atiku addressed a world press conference rejecting the result of the presidential election result announced by the Independent National Electoral Commission (INEC). In the keenly contested race, INEC declared APC candidate, Muhammadu Buhari winner of the election after polling a total of 15,191,847 to defeat his closest rival and the PDP candidate, Atiku, who polled 11,262,978.